KUTX Live presented by Live Vibe returns!! 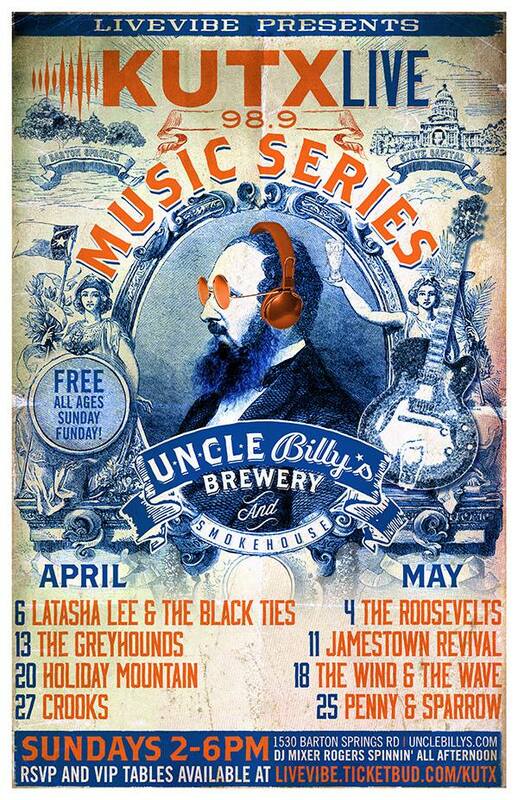 This season it will be at Uncle Billy’s Brew & Que at 1530 Barton Springs Rd in Austin, Texas. We are going to throw down EVERY SUNDAY from 2-6pm. So many great bands. I will kick things off at 2pm. The band goes on at 3pm. And then I will take it to the house, finishing things off around 6pm. It’s ALL AGES and it’s a FREE SHOW but if you’d like some VIP treatment, you can get on that right here. The best Sunday Funday in Austin. See you there! This entry was posted in Shows and tagged ATX, Austin, austin centric, Bands, Billy's, Cam, collective, DJ, Fun, Funday, kut, KUTX, KUTX Live, Live, live vibe, Mixer, Mixer Rogers, Music, Party, Rogers, shipley, Show, sunday, Uncle. Bookmark the permalink.